Add sheer comfort, support and energy to every step. 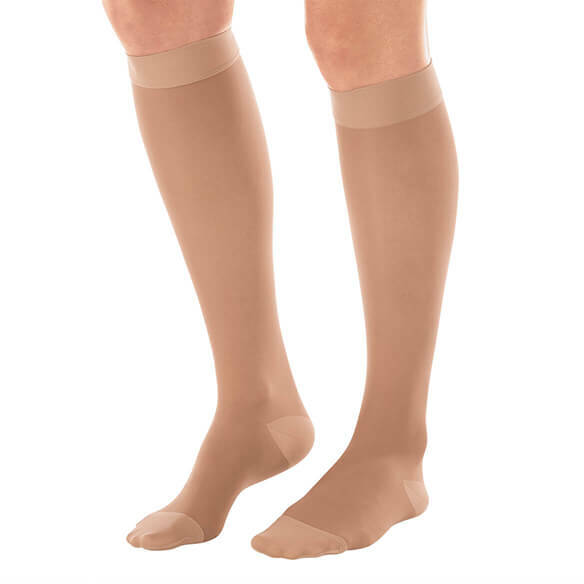 Graduated 15–20 mmHg compression knee highs help keep circulation flowing for healthy legs and feet — ideal for relieving tired or aching legs, minor swelling, and mild to moderate varicose and spider veins. Luxuriously smooth, sheer fabric is a fashionable complement to dress or casual wear. With comfort features like a defined, reinforced heel and toe and a non-binding top band, they're perfect for travel and long periods of sitting or standing. 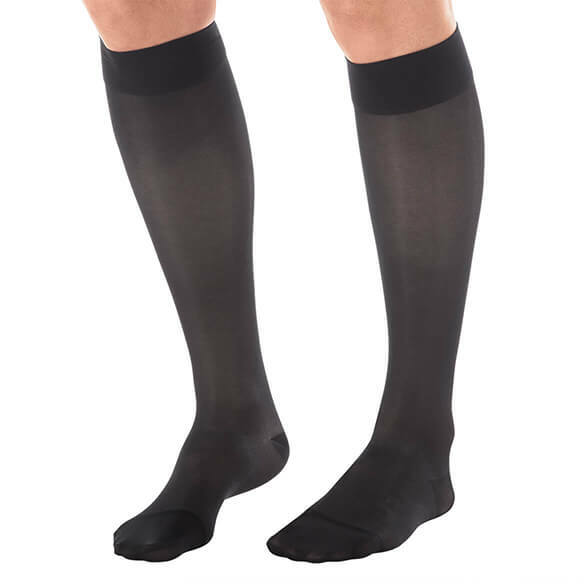 Includes 1 pair of latex-free knee highs. Specify size: Small (Ankle: 7"–8 1/4"; Calf: 11"–15"), Medium (Ankle: 8 1/4"–9 1/2"; Calf: 11 3/4"–16 1/2"), Large (Ankle: 9 1/2"–10 3/4"; Calf: 12 1/2"–18"), XL (Ankle: 10 3/4"–12"; Calf: 13"–19"), 2XL (Ankle: 12 1/2"–13 3/4"; Calf: 19 1/2"–22") or 3XL (Ankle: 12 1/2"–13 3/4"; Calf: 21 1/2"–24"). 80% nylon/20% spandex. Hand wash; line dry. Made in USA. I need to wear compression hose when I travel. I wanted the black and beige pairs to wear on the plane ride. need some i can afford. Replacing some like this from different company. Have used these before on plane flights. Has just the right compression. I've tried other compression socks but they never fit right. Always too tight and very painful to wear. This is the only item that offers 3X size. I'm hoping they will be more comfortable to wear.